Sanitary High Purity Ball Valves – Top-Flo® Series 77 have been developed to specifically address the stringent guidelines of the pharmaceutical and BIOPROcessing industries. 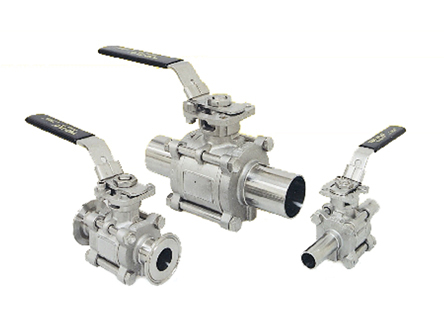 These Sanitary High Purity Ball Valves innovative design includes construction from 316L stainless steel material on all wetted parts providing full traceability. Seat material is manufactured from TFM and meets U.S. Pharmacopoeia Class VI certification. Patented viewing windows facilitate stem seal leak detection. Sanitary High Purity Ball Valves – Top-Flo® Series 77 offer superior leak detection, thanks to a live-loaded packing system with Bellville washers and double V ring packing. Sanitary High Purity Ball Valves – Top-Flo® Series 77 are compliant with ASME/BPE 1997 and are suitable for pressures up to 1000 psi.